Welcome to the December 2010 issue of our Family Games Treasurehouse newsletter. With Christmas almost upon us, many people are in the thick of the season of thanksgiving and celebration, including parties galore. While Christmas is primarily about celebrating the birth of Jesus Christ, many people use it is a great opportunity to get together with family, friends and other loved ones. As you think about Christmas party games, don't forget to consider some games especially for children. Balloon Relay is a terrific Christmas party game for active kids, requiring a green balloon, a red balloon (the traditional Christmas colours), two chairs and two rulers. Sort the children into two teams at one end of the room behind a starting line. One team receives a red balloon and a ruler while the other receives a green balloon and a ruler. The first player in each team must use the ruler to bat the balloon to the other end of the room, around their chair and back to the starting line. The next player takes the ruler and continues the relay until one team finishes. Christmas Card Hunt is a game suitable for young children but able to be enjoyed by anyone. You will need at least three old Christmas cards for each player. Prior to the game, cut the cards in half through the middle. Put the top halves of the cards in a box and spread the bottom halves around the room. At the beginning of the game, players take one part of a card from the box and attempt to find the matching half from those distributed around the room. When a player does find the matching half, they return to the box and choose another half, until there are no more cards left. At the end of the game, the player with the greatest number of completed cards wins. Jingle Bells is an active Christmas game for children of all ages. You will need a small bell, an open space for everyone to move around and a blindfold per player. All the players are blindfolded, except one who is given a bell. The player must move around the area, jingling the bell continually while saying "Merry Christmas!" while trying to avoid being caught by the blindfolded players. If he is caught, he swaps the blindfold and bell with the other player. 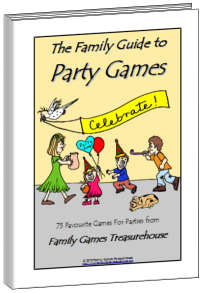 As we announced last month, Family Games Treasurehouse has released two new ebooks chock full of party games. "The Family Guide to Christmas Party Games" contains twenty four of the most popular Christmas party games from our website, including icebreaker games to kick-start your party, games suited to young children, active games, table games, trivia games and gift exchange games. At only $5.95, it's a bargain. 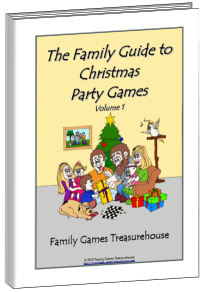 We have also released "The Family Guide to Party Games", a huge 96 page ebook containing seventy five games, many of which are exclusive to the ebook and are not available on our website. Don't forget! As a special promotion for the release of these two ebooks, I am offering an exceptional deal until 31 December 2010. "The Family Guide to Party Games" is normally $12.95 on its own, but for a limited time I am offering both ebooks as a bargain bundle for only $8.95. I have also thrown in two additional bonuses: our special report on "Choosing the Best Games for Your Child's Party" and "Party Theme Ideas for Kids", which includes more than 200 theme ideas to make their party even more memorable. For more information on these terrific ebooks, go to our ebook sales page. As if that's not enough, I am offering our faithful newsletter readers an added incentive. When you order either The Family Guide to Christmas Party Games alone or the Family Guide to Party Games bundle, you can receive a 10% discount as our way of saying "Thank you" for subscribing to our newsletter. Simply type in the word "Subscriber" as you order your ebook/s and the discount will be automatically applied. One final offer. We would like to include some testimonials on our sales page and we need your help. If you purchase an ebook and enjoy using it, please send us an email with a personal review of the ebook, together with your photo. If we publish your testimonial on our sales page, we will refund your purchase price in full, as a way of saying "Thank you". Send your review and photo to our sales support team (sales@family-games-treasurehouse.com). May you and all your loved ones have a really blessed Christmas and New Year.